The TF Mini LiDAR is an unidirectional laser range finder based on time-of-flight (ToF) technology. It consists of special optical and electronic devices, which integrates adaptive algorithm for indoor and outdoor application environment. 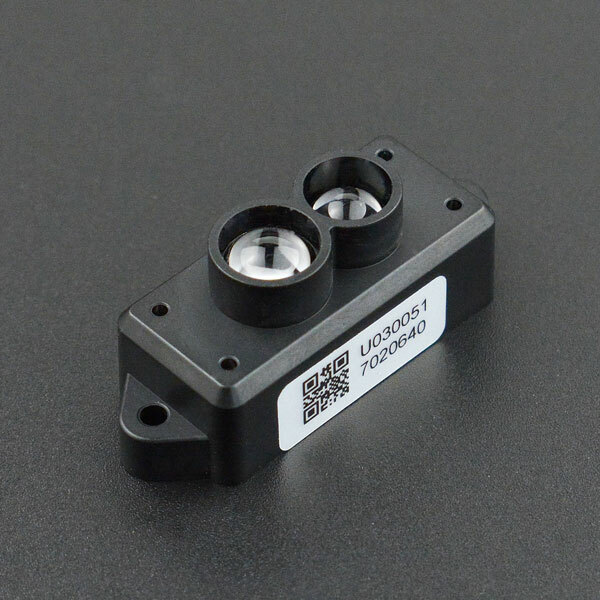 It has tiny body and high performance in distance measurement. The laser sensor can be used as a distance-measuring tool to detect the distance from it to obstacles. It can also be used as an eye of a robot; it provides distance information for robotic safe avoidance and route selection. It supports for system automation in a variety of machine control scenarios. Because of its small size, light weight and low power consumption, it is also suitable for altitude holding and terrain following. TF Mini's maximum detection distance is 12 meters. 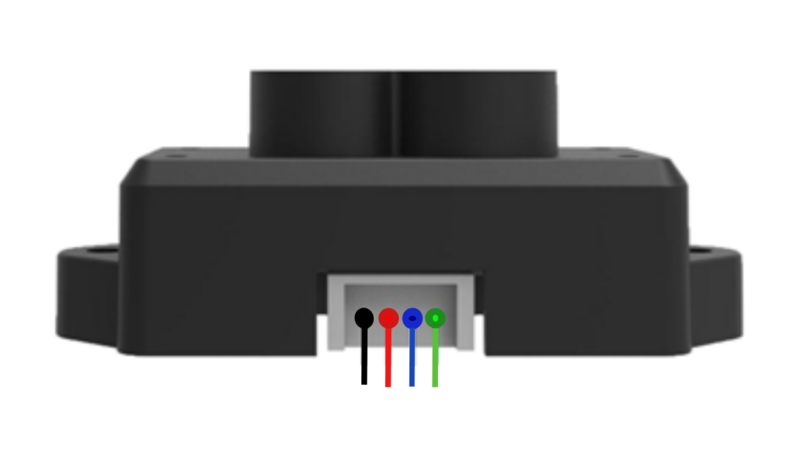 TF Mini also supports 100Hz sampling resolution, within 6 meters, its accuracy is within 4cm, 6~12 meters, accuracy within 6 cm. FOV of 2.3 degree. Its anti-interference is strong, and can work in outdoor light, the overall weight is 4.7g. TF Mini LiDAR adopts UART (TTL) communication interface, can supplied by standard 5V, and its average power consumption is 0.6w. 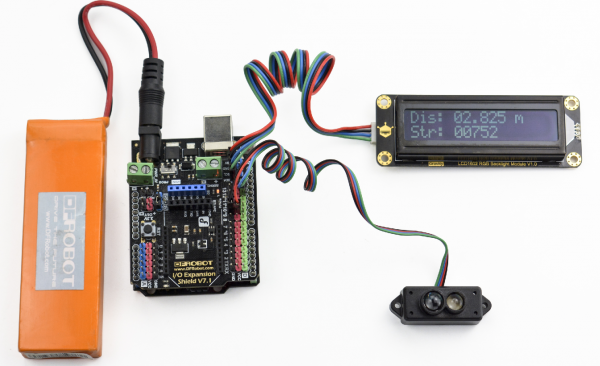 It can be compatible with a variety of Arduino controllers. 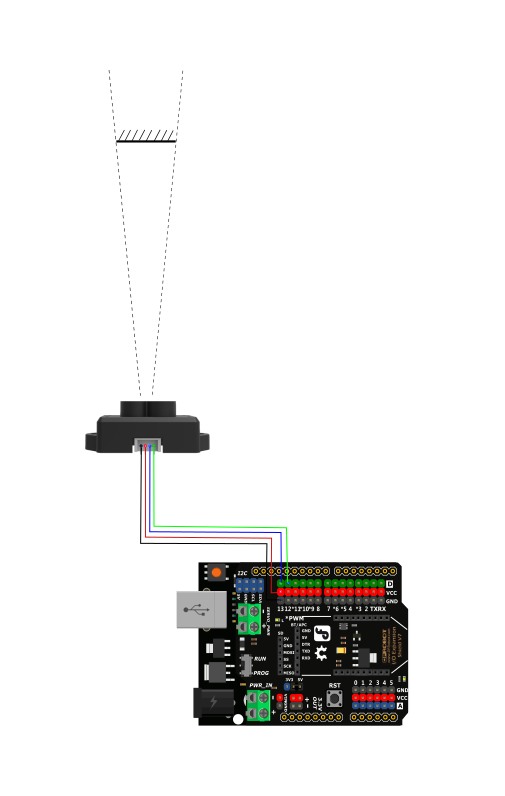 With the DFRobot Gravity IO Expansion Shield, Arduino can be plugged in directly without additional wiring. 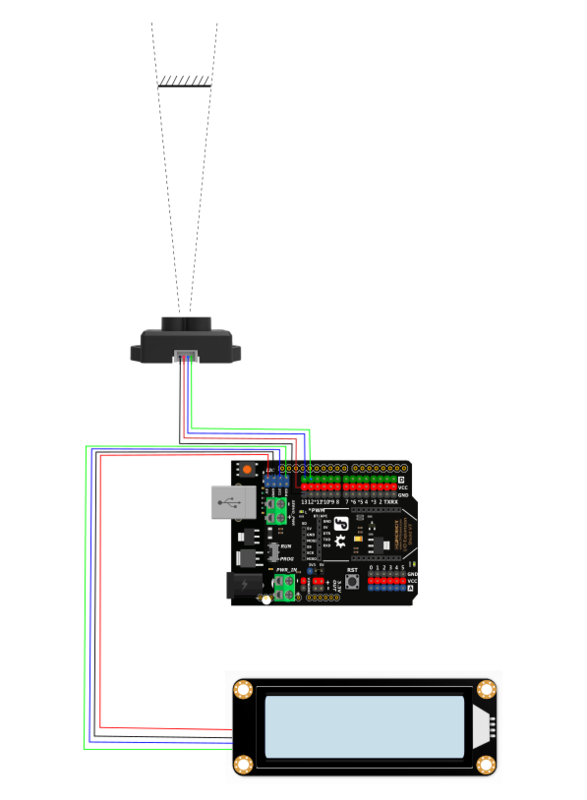 It can be easily integrated into the system when used with the Arduino library developed by DFRobot. Here are two ways listed to make the LiDAR(ToF) laser range finder be more intuitive. Since TF mini is a serial device and the ordinary Arduino only has one hardware serial port, so we recommend you to use a software serial port to match the sensor. Users can also use multi-serial port devices such as Arduino Leonardo and Arduino Mega2560. Here we choose Arduino UNO as a controller, which is very common to see and define D12 and D13 as software serial port. Use PC-side serial port to display the detected distance and power the entire system. PC serial port tool is needed. 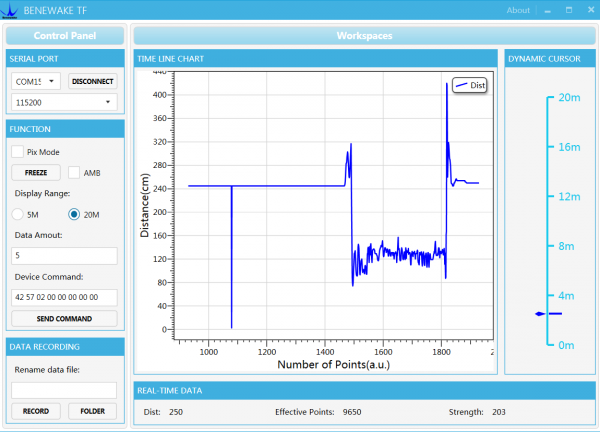 Data been read will be displayed in the serial port tool interface. In practical application, the sensor will generally work offline. We provide a special case, which powered by a lithium battery and display distance measurement data with LCD. It is especially suitable for outdoor usage. 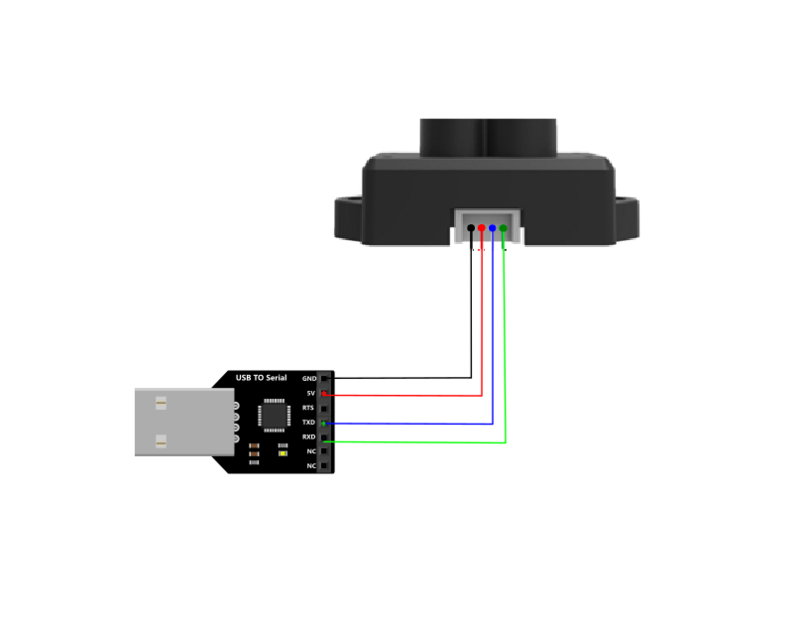 Connect TF Mini LiDAR(ToF) Laser Range Sensor to PC by an USB to TTL converter and read data by upper PC. We use the signal strength 'Strength' to distinguish between the two colors. NOTE: The code needs to be used in concert with TF Mini Library. Downloaded the program, when you repeatedly measure white and black paper at the same distance, a signal strength changes could be seen through the serial port drawing tool. 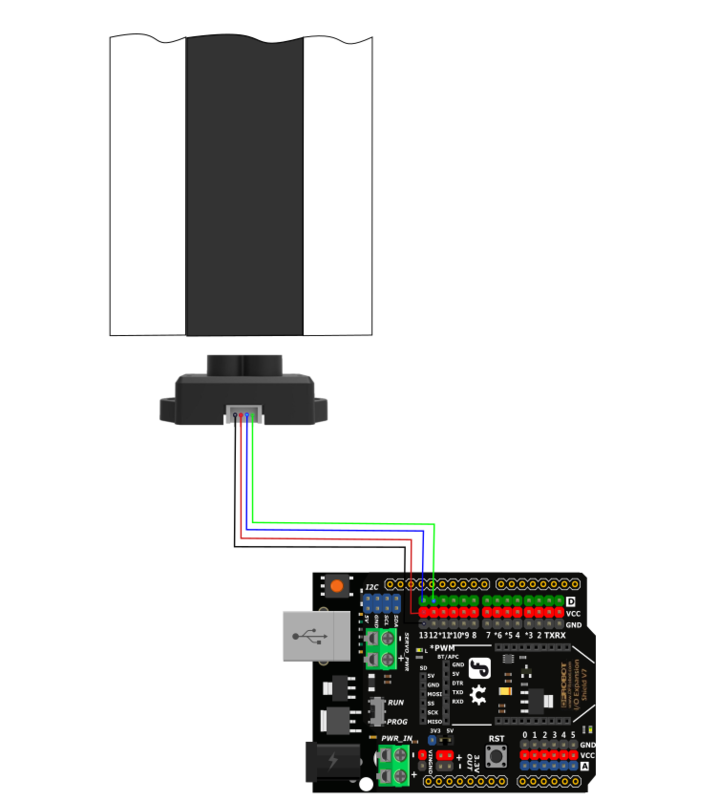 Get TF Mini LiDAR(ToF) Laser Range Sensor from DFRobot Store or DFRobot Distributor.